Thailand is a Kingdom in Southeast Asia. It is bordered in west and northwest by Myanmar (Burma), in south west by the Andaman Sea, in east and north east by Lao PDR, in south east by Cambodia, in south by the Gulf of Thailand (an inlet of the South China Sea), and by Malaysia. In south the country occupies a part of the Malay Peninsula. Thailand shares also maritime borders with India, Indonesia and Vietnam. With an area of 513,120 km², the country is slightly larger than Spain or slightly more than twice the size of the U.S. state Wyoming. Until 1939 the country was known as Siam. Thailand has a population of 68 million people (2015). Capital and by far its largest city is Bangkok. Spoken language is Thai (official), some English in tourist regions. Thailand has two principal river systems, the Chao Phraya and the Mekong river, these rivers are crucial for the irrigation for Thailand's rich agricultural economy. Doi Inthanon with 2,565 m (8,415 ft), is the highest mountain in Thailand. Thailand is the second most visited tourist destination in the Asia-Pacific region with almost 30 million international tourist arrivals, only surpassed by China with 57 million arrivals (2015). Principal airport of Thailand is Bangkok's Suvarnabhumi Airport (IATA code: BKK), other major airports are: Bangkok's Don Muang Airport (IATA code: DMK), Chiang Mai International Airport (IATA code: CNX), Chiang Rai International Airport (IATA code: CEI), Phuket International Airport (IATA code: HKT), and U-Tapao International Airport (IATA code: UTP). Map is showing Thailand and the surrounding countries with international borders, the regions of Thailand, the national capital Bangkok, major cities, expressways, and major airports. Ubon Ratchathani, Udon Thani, Uthai Thani, Uttaradit, Yala, and Yasothon. 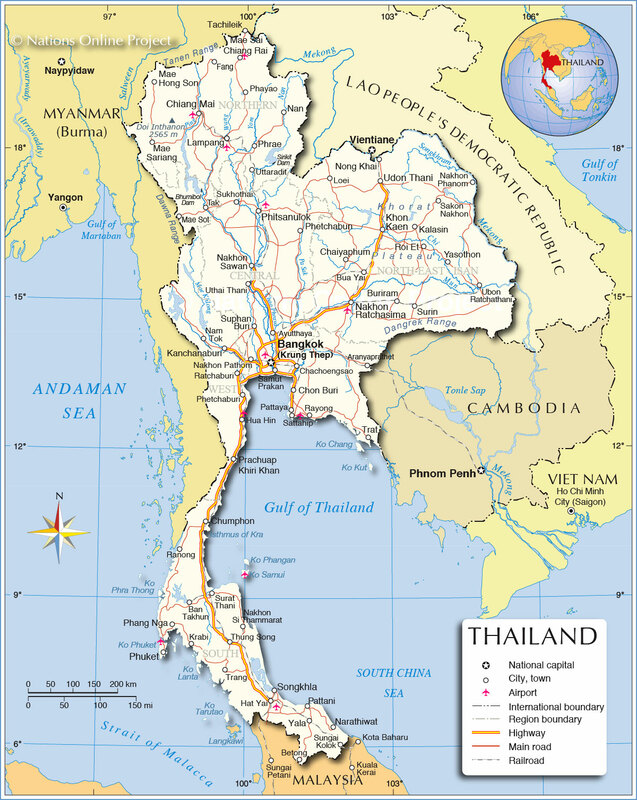 Thailand is traditionally divided into 4 regions: North, Central, Isan (Eastern-Thailand), and Southern Thailand. Today for various reasons Thailand is divided into 6 regions, or more precisely 6 regional groups of Thai provinces. The regions are: Central Thailand, including the Thai capital of Bangkok, Eastern Thailand, Northern Thailand, Northeast (Isan), Southern Thailand and Western Thailand. This regions are furthermore divided into all in all 75 provinces (จังหวัด, changwat) which all are named after their capital, beside the provinces there are 2 special governed districts, namely: the capital city of Bangkok (in Thai: Krung Thep Mahanakhon) and the city of Pattaya.